Our Emergency Department provides high-quality 24/7 emergency care to the central Vermont community for medical emergencies such as broken bones, car accidents or heart attacks. We staff the Emergency Department 24 hours a day, 7 days a week. The emergency room at CVMC provides state of the art emergency medicine to the residents of our community. Staffed 24/7 by board-certified physicians and advanced practice providers, and supported by an experienced team, CVMC is ready to treat patients with chest pain, stroke-like symptoms or other life-threatening events. For non-emergent issues, where patients will still benefit from being seen by a physician or advanced practice provider, CVMC ExpressCare has convenient locations and hours in Berlin and Waterbury. All patients must register when they arrive with information such as name, address, family provider and insurance coverage. STEMI Care: STEMI stands for ST Elevation Myocardial Infarction. That refers to patients having active heart attacks and we treat this with the utmost urgency, stabilizing and rapidly delivering our patients to the University of Vermont Medical Center or Dartmouth-Hitchcock Medical Center for emergent cardiac catheterization and further intervention treatment. Stroke Care: Stroke, too, is a condition requiring rapid identification, stabilization, and treatment. If appropriate, we use medication that can open up a blocked artery in the brain. 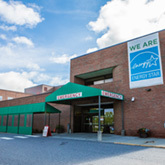 In some other cases, we transfer our patients to the University of Vermont Medical Center or Dartmouth-Hitchcock Medical Center where advanced interventional therapies can be carried out. Trauma Care: Some trauma patients who are stabilized in our Emergency Department will be transferred to the University of Vermont Medical Center or Dartmouth-Hitchcock Medical Center for further evaluation and treatment. In addition to our excellent local ambulance crews, we also have access to DHART (Dartmouth-Hitchcock Advanced Response Team). DHART air medical transportation operates 24 hours a day and seven days a week. DHART helicopter crews transport adult, pediatric and neonatal patients to ANY appropriate medical facility in New England. The Emergency Department at CVMC treats all patients without regard to their insurance coverage or their ability to pay. If you have insurance, bring your insurance card with you and present it at registration in the ED. Some insurance companies require a referral from the primary care provider to provide full coverage. Coverage may also be reduced or denied if your insurance company determines that your visit did not meet their criteria for an "emergency." Please refer to your insurance policy so that you fully understand the coverage provisions for use of the emergency department. Making arrangements to see a provider or specialist.